SPOILERS ARE HERE!!! RED ALERT!!! All right folks, shields down. There are two cards on the first week’s spoiler list that excite me enough to want to do a full Top Ten list on them — Panharmonicon and Madcap Experiment. Both are really strong and bring their “A”game of powerful options and interesting synergies. So, let’s flip a coin and choose one for this week! Heads it’s the Madcapping Fun Times and Tails it’s the PandemoniumHarmonica. All right . . .
Well, as I’m sure you could tell by the title of this article, we flipped the Panharmonicon. Did you know that the Panharmonicon is an actual real world instrument created about two hundred years ago, and that Beethoven’s Wellington’s Victory piece was written for it? It was one of the first instruments that played others, and you could use it to automatically “play” brass, winds, and a full orchestra. It was created by the same person who created the Metronome. Well a few things. First note that it only works if either a creature or an artifact arrives on your battlefield. That means you won’t get the Panharmonicon goodness with something like Flight of Fancy. It’s an enchantment that triggers on arrival and draws you some cards, all Mulldrifter like. That’s not an option. Neither are cards like Bojuka Bog or Halimar Depths. Those don’t work here at all. So the obvious place people are looking are either creatures or artifacts that fire off when they arrive at the table, all ready to rock. Stuff like Solemn Simulacrum, Mycosynth Wellspring, or Civic Wayfinder. That’s the first level of Panharmonicon loving. But there is certainly another level here. Note that the trigger works for any permanent you have. If you have a creature/artifact arrive at the battlefield, and something else triggers, as long as that something else is a permanent, you will get the free copy. Take Angelic Chorus as a good example. When a creature arrives, there is an enters-the-battlefield trigger that fires. So you’ll gain twice the life from that Chorus. And that’s good stuff. Is an emblem a permanent? No, so the ultimate of some ‘walkers like Kiora, Master of the Depths won’t trigger your Panharmonicon. Sorry Johnnies! 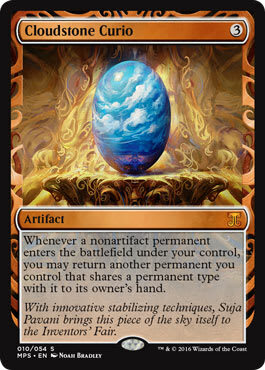 A lot of folks have been talking about this card being worse than the Resonator. And it’s both more limited and more powerful at the same time. It’s like saying Devastation is worse than Jokulhaups because it leaves behind the artifacts. Sure but that’s where you to build your artifact-heavy deck with a lot of artifact mana and stuff. That weakness isn’t any such thing. The Resonator can work on any trigger you have. It doesn’t have to be from a land or creature initially. And it’s not required to be an ETB one at all. You can copy death triggers, leaves-the-battlefield triggers, landfall triggers, and more. And you can use it on all of the emblem triggers as well, so enjoy that corner case. That’s a lot more flexibility! But there is a cost. It takes 2 mana to rock that, whereas the Panharmonicon takes no investment of mana. And the Resonator taps, so you can’t reuse it. But your new best friend can copy your stuff over and over again, and works as many times as you have triggers that meet that condition. 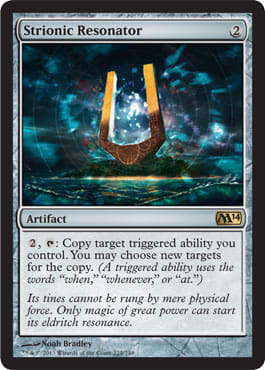 It’s like saying Mirari is better than a hypothetical artifact that forks all of your Blue instants and sorceries for free, with no additional cost. In a Blue deck, the Mirari is so (comparatively) weak it’s not funny. On a similar line of thought, you and I both know that you will only toss the Panharmonicon into a deck where it makes sense and works. And there, you are going to be glad you don’t have the Resonator’s power level. Virtually every card that works with Panharmonicon is going to be happy with a creature that heads out for a smoke break, and then returns to the battlefield. So the Closet is great as a mana-free repeatable way to get more triggers from all of that good stuff you have going on. Elvish Visionary. Mnemonic Wall. Phyrexian Gargantua. Even though those aren’t the commonly quoted stuff people are looking at, they still work. That’s the value of the Closet. There are a lot of crazy and fun ways to abuse the Panharmonicon out there. Everybody knows about the abusive stuff like Primeval Titan and Mulldrifter. We get that. But there are a ton of creatures and other triggers out that that produce creature tokens. And I want to lean on them hard. 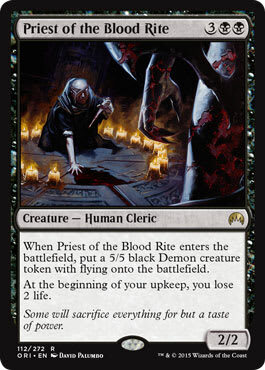 Take a simple creature like Priest of the Blood Rite. It arrives and you get a 5/5 flying Demon for free. Well, you get two with the Panhandling Harmonica. It’s like a Doubling Season for your token creatures. You can get four 2/2 Zombies off Grave Titan or four 3/3 Golems off Precursor Golem. Grab a full army of 1/1 Myr with Myr Battlesphere. Huntmaster of the Fells has those cool Wolves, you can make Goblins with stuff like Beetleback Chief or Siege-Gang Commander and more! Pia and Kiran Nalaar? Blade Splicer? You get the idea! 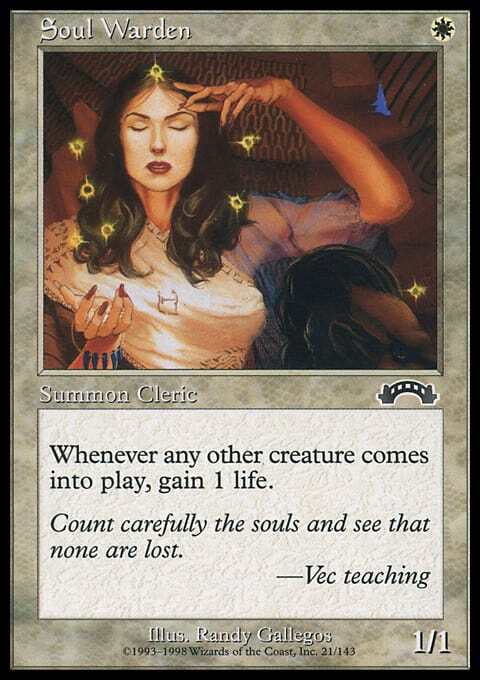 One of the best and yet most subtle creatures in multiplayer history is the Soul Warden and all of the friends that followed during the years (Essence Warden, Soul's Attendant, Auriok Champion, Healer of the Pride, Pious Evangel, Suture Priest) . Drop them early, and then ride the slow gentle current of life-giving joy to raise your life total under the radar as opposed to doing it all at once in a major cry for attention with a card like Congregate. Soul Warden has a proven cachet at the kitchen table, and now, you have another home for it! Penance for the Curio. It’s grown into one of the most popular Johnny combo tools. Drop one thing, and bounce another. Get some more triggers for ETB stuff. Pull a creature back from a painful aura like Faith's Fetters. Use it to make mana with Great Whale or Cloud of Faeries. 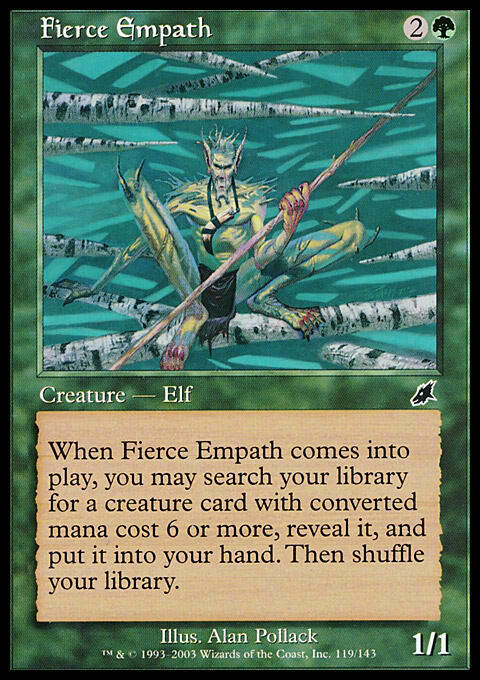 (Tap and untap a Karoo land like Simic Growth Chamber). And now you get two bounces, for more triggers, for more free triggers from your Panharmonicon for more bouncing for more triggers . . . You get the point. Get your inner Johnny on! After playing around with this, it’s been as good as I thought. 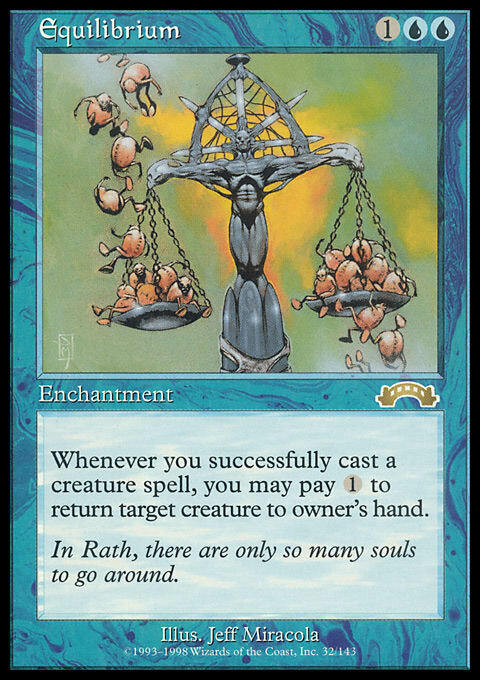 You play it in a variety of situations — to escape a Wrath of God, to keep creatures that just blocked a huge attack from dying, top reload a bunch of ETB triggers and more. It’s an answer to a lot of problems in any multiplayer game. 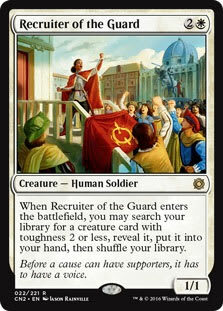 Blinking out your whole team, or all of the pertinent folks, is a card that is extremely synergetic with Panharmonicon. You can rack up a metric ton of triggers as all of those creatures return to your battlefield all ready to rock and roll. After Visions debuted and brought with it creatures that had enters-the-battlefield triggers (there are five total), the creatures that killed something on arrival gained the nickname 187 creatures. This comes from the California Penal Code, where 187 is the code for murder. Two of the initial creatures qualified — Uktabi Orangutan and Nekrataal. Ever since then we’ve had a number of creatures qualify, including heavyweights like Acidic Slime, Woodfall Primus, and more. Avalanche Riders and Ogre Arsonist. Cloudchaser Eagle. Indrik Stomphowler. Bone Shredder. Batterhorn. And to a lesser degree, kicker-creatures like Thornscape Battlemage or Thunderscape Battlemage. (I’d also count Flametongue Kavu and friends here as well) All of these creatures have huge value because they give you a guaranteed kill and a body as well. And the body can swing, block, grab a big fat Loxodon Warhammer and smash someone’s face. They can be Zombify-ed back to the battlefield for another go. They can be Momentary Blink’ed as well. They have serious value. And the Panharmonicon increases that value considerably. After seeing the power of a 187 creature or a token making creature on a cyclopean level of power, now you are ready. This is the most powerful thing you can stick on your typical ETB trigger. This is where everything goes to pieces. All of these cards are good. But getting two triggers off a Fierce Empath or Recruiter of the Guard is just sick. Tutor for two problems. Two solutions. One of each. 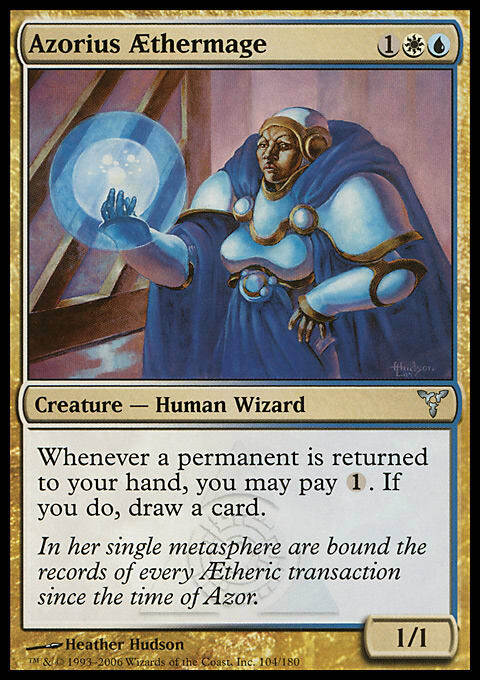 Take a typical example — grab that Nekrataal and Eternal Witness. And then kill two creatures with the Nekrataaland return two cards with the Witness. It spirals out of control with typical, uninspiring tutor targets that everyone is running. And from there it just breaks. Bring back two Witness triggers that also have triggers. Block or attack suicidally with that Fierce Empath to bring it back as well. And if you get Rune-Scarred Demon? Well that’s game over. This trick also works for other creature-based tutors that grab a subset of cards, like Totem-Guide Hartebeest. 2. Sigh. 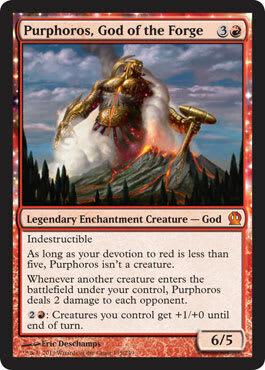 Purphoros, God of the Forge. Sigh. This might be one of the most obvious entries on today’s list, but it needs to be said. Purphoros is just sick with ill-tidings for everyone with the Panharmonicon. Take a simple Beetleback Chief. You would normally play it and have 6 damage of Purphoros loving getting dispersed to all of your foes. Did your Beetleback Chief just make another two dorks? Well now it’s ten smasheries! And shoot, you don’t even need the Makers of the Tokens to make this really broken. Karmic Guide? Sun Titan? Norin the Wary? You can see the combos and the damage just get silly. Purphoros for the smash win! I have a great deck that abuses cards like Equilibrium, Azorius Aethermage, Aura Shards along with self-bounce like Whitemane Lion and Fleetfoot Panther. The deck was originally a 60 card Standard deck that morphed into a Commander deck. While that is not, and should not be confused with, a blink deck, it has a lot of enters-the-battlefield triggers layered in. And Panharmonicon is a great way to abuse that. It synergizes with most of the cards in the deck. And there we go! 10 powerful ways to abuse the Panharmonicon. You can break your playgroup into little tiny Purphoros smashed pieces. Fall of the Hammer indeed. And you have tons more I didn’t even mention. For example, let’s not forget the creatures that die and return with persist or undying that also have these triggers. They are better for your Panharmonicon than one with indestructible. Twilight Shepherd. Kitchen Finks. Puppeteer Clique. Murderous Redcap. Furystoke Giant. Woodfall Primus. Geralf's Messenger. River Kelpie or Flayer of the Hatebound are odd but would hit you as well. 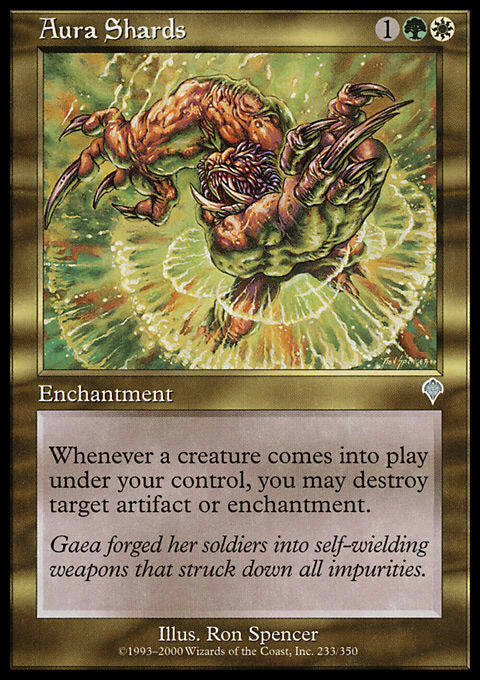 What cards are you most working to abuse? And what did I miss above? There’s a ton of depth under this card. So get ready for trigger overload!